The Oath of the Horath by Jacques-Louis David, Part 11 of the Introduction to Art and Artists of Our Time. From the picture by Jacques-Louis David. JACQUES-LOUIS DAVID was born in Paris in 1748. His father was killed in a duel, and he was adopted by an uncle, an architect named Buron, who took upon himself the charges and direction of the boy's education. His uncle and his mother wished him to become an architect, but his inclinations were toward painting, and he was accordingly placed under the tuituon of Boucher, with whom his family had some ties of relationship. But Boucher, whose ill-regulated life hardly fitted him for the care of a boy, and who beside felt himself growing old, soon resigned the task, and recommended the young David to the care of Vien. Vien had at that time just returned from Rome, where he had been pursuing his studies as a pensioner of the Academy. His talent had been formed upon models more severe than had been adopted by the French artists whom we have just been considering, Watteau, Fragonard, Greuze and Boucher; and he was already exercising an influence on the pupils he gathered in his studio, and even on the members of the Academy in the direction of a return to the principles of classic art. Vien was struck by the drawings which David showed him, and admitted him to his studio, where he remained for several years, pursuing his studies with great diligence. He attracted the attention of a relative, Sedaine, the Secretary of the Academy of Architecture, and by his influence David obtained a lodging in the Louvre, and it was there that his first attempts were made at painting for himself. He now determined to compete for the Roman Prize. This he did for five successive years. On the second trial he obtained the second prize, but it was not until the fifth year, when he was already twenty-seven years old, that he finally succeeded. M. Delecluze, in his highly interesting work, "Louis David, son Ecole et son Temps," tells an anecdote of David at this period which forcibly illustrates his character. After his fourth failure to obtain the Grand Prize, David shut himself up in his room, and for two days nothing was heard of him. Sedaine, who had his lodging next to that of David, became troubled at his absence, and knocking at his door was alarmed at hearing groans within, and calling on Doyen, another member of the Academy, for help, the two finally after much trouble persuaded David to open the door. When he did so he was seen to be pale and fainting; he confessed to having eaten nothing for a day, and to have determined on suicide. This mixture of force and weakness shown at the outset of his life is characteristic of the man, and will be found to throw a light on many of the incidents in his singular career. The persistence he had shown in competing for the Roman Prize and his despair at his ill success, excited at once the respect and the pity of his friends, and Le Doux, an architect, the third of this profession who had had a hand in shaping the destiny of David, interested himself to procure him a commission. Le Doux had built a pleasure-house for Mlle. Guimard, a celebrated dancer at the Opera, and Fragonard had been employed in decorating it with frescoes. The work had been delayed, and the actress, impatient, had remonstrated with the easy-going luxurious Frago with some show of temper. "Come, come, M. Fragonard! When will this be finished!" "It is finished," said he, and took his palette and brushes and departed, leaving Mlle. Guimard in a towering rage. Fragonard had painted the dancer as Terpsichore, but the story goes that he returned to the house in the absence of the lady, and by a few dexterous touches transformed the smiling goddess into a Fury, while preserving the likeness. In this state of affairs, Le Doux saw an opportunity to advance the fortunes of David, and sent him to ask the consent of Fragonard to complete the unfinished commission. Fragonard smilingly consented, and David, grateful, long retained the remembrance of his amiability. At this time David was entirely under the influence of the style which had been made the fashion by Boucher and Fragonard. In the intervals of his employment upon the decoration of Mlle. Guimard's house he painted her portrait, which he treated entirely in the style of Boucher. In after years he showed this portrait to his friend and pupil Delecluze, with the remark that the sight of it was doubly agreeable to him because it recalled the face of one who had shown him the greatest generosity, and also because it proved the necessity for the reform which he had brought about in the art of painting. In 1775 Vien, who had been made Director of the French School at Rome, invited David to accompany him. David up to this time had been, as we have said, entirely under the influence of the reigning taste in France, and one of the strongest in the belief that French artists had nothing to learn from the Italians; still he did as was the fashion, and followed his master to Italy, if for nothing else, to prove the superiority of his countrymen, and to learn what to avoid. His eyes were first opened at Parma, where the Cupola of the Cathedral showed him the wonders of Correggio's pencil, creating a heaven of cherubs and nudities that was like an apotheosis of Boucher, and which amazed him to that degree that Vien was obliged to counsel him to wait until he had seen the greater wonders of Raphael and Michelangelo in Rome. He resided in Rome for five years, from 1775 to 1780, and under the direction of Vien he submitted during the first year to making studies from the antique and from the great Italians. The results of this industrious devotion were collected in two large folio volumes, and the sketches show an effort on David's part to escape from the Academic restrictions that surrounded him and to put life into his work instead of contenting himself, as other students about him were doing, with copying closely the models given him. Delecluze describes one of these drawings given to him by David himself with an explanation which shows the turn his ideas were taking. He had copied from the antique the head of a youth sacrificing and crowned with laurel. He had copied it faithfully, endeavoring to retain the expression of repose that marked the original. "This," said David, "is what I called at that time the antique uncooked. When I had copied this head as closely as I could, I went home and made this other head, which I seasoned with modern sauce. I disturbed a little the regularity of the eyebrows, I raised the cheek-bones, I lightly opened the mouth I sought to give the head what we then called 'expression,' and what I now call [this was in 1807] 'grimace.'" Nothing could better illustrate than this anecdote, the relation of the art of David and his school to the antique art in its purity. He returned to France in 1780, and a short time after was made an Academician and given a lodging and a studio in the Louvre. As for a long time the artistic life of Paris centred round this building, whence issued the influences that formed the new times, it may be interesting to quote the account given by David's pupil Delecluze, of the arrangement of the lodgings and studios of the artists who made the famous colony of the Louvre. It is difficult for those who have only known the Louvre since the ground between it and the Palace of the Tuileries was cleared and the two buildings were united and made one, to conceive the state of things that existed in David's time. The whole of this vast quarter was filled with narrow, crooked streets and tumble-down houses, and it was in one of these streets that the attempt was made to assassinate Napoleon by means of the so-called "infernal machine," an attempt which had for one of its results an order from Napoleon to clear away the obstructions that filled the square, and thus prepared the way for the final improvements undertaken and successfully carried out by Napoleon III. Down to 1796 a large part of the Louvre remained without a roof, but Napoleon, who had conceived the idea of an Imperial Museum, in which to place the pictures and statues stolen from Italy, together with whatever art-treasures existed in France, caused the Long Gallery, which had been begun by Henri IV. to connect the Louvre with the Tuileries, and which he had completed so far as to be able to walk through it before his death, to be prepared for the purpose. The opposite sides of the building, the angle of the Grand Colonnade, and the portion that fronts on the rue de Rivoli were given up by the Government to the artist-pensioners, who, however, were not confined to this quarter, but were lodged also in other parts of the building, where they arranged matters to suit themselves, putting up walls and partitions where it suited them, until the side next the court-yard was lined with a row of dens lighted by the immense windows that gave upon the court, while the other half of the vast halls facing the street were for the most part left empty and undivided, the walls bare and the timbers of the roof exposed. The sanitary arrangements of the building were villainous, and it is incredible to our outwardly more decent times, that the artists who lived in this building with their wives, their daughters and their families, and who were visited by the rich amateurs of the time, and by others high placed in society, could have lived without complaint in a place described as so revolting to cleanliness and decency. The place assigned to David for a studio and for the accommodation of his numerous pupils, was in the square at the angle of the colonnade and the north side of the Louvre, where is now the grand stair-case erected by Napoleon I. The studio, as described by Delecluze, was about forty-five feet long by thirty wide. Its plastered walls were covered with an olive-gray wash in distemper, and the only light entered by an opening nine feet from the floor and giving upon the colonnade. 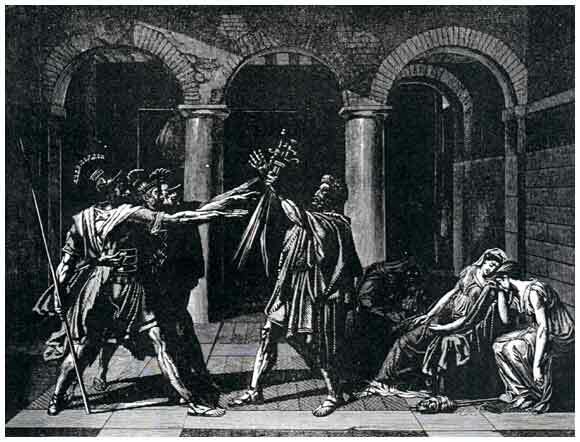 At the left on entering was hung the picture of the "Oath of the Horatii," and on the right the "Brutus." It was the former of these famous pictures so much talked about at the time that gave this studio its name "L'Atelier des Horaces." But the furniture of this studio must not be forgotten, since the fashions introduced by David had such an influence in his own time, and one that has by no means lost its hold on ours, as to make an essential part of the history of the art we are coming to consider. David was not the author of the fashion for things classic that prevailed in his time, but he was so deeply imbued with the tastes and feelings that shaped it, that his pictures in which he embodied the ideas of Greek and Roman heroism, piety, and the love of liberty were the spark that set all into flame, and put vitality and, so to speak, moral force, into what otherwise would have remained a mere matter of passing fashion. Up to this time, the furniture, even in the wealthiest houses, was still made after the fashion of the times of Louis XV., which was borrowed from that of the preceding reign but modified into larger and more easy forms. The furniture of the studio of the Horatii was of an entirely different character. Instead of the white and gold or gilded chairs covered with tapestry from the Gobelins or from Beauvais, David employed mahogany, a wood then newly introduced, with cushions of red woolen bordered with palmettes and guilloches borrowed from the vases and other objects found in the then recently exhumed towns of Herculaneum and Pompeii. Instead of the wide and easy chairs called bergeres, made to accommodate the spreading hoops and garlanded petticoats of the ladies of Louis XV. 's time, there were seats modeled on the curule chairs of the ancients, the extremities of the double X terminating at the tops in the heads of lions, and at the bottom in the claws of the same animal. At one side of the room was a huge sofa made of solid mahogany with brass mountings and cushions of red and black, the whole believed to be faithfully copied from the antique and made by the great cabinet-maker of the time, Jacob, after the design by David himself and his pupil Moreau. All these objects executed after the taste of David were, properly speaking, studio-objects, since the master continually copied them in his works, as we can assure ourselves by comparing this description with the furniture seen in the pictures "The Death of Socrates," "The Horatii," "Brutus," "Helen and Paris," and the sketch for the portrait of Mme. Recamier. All this furniture had already been made for five or six years when, in 1796, Delecluze, then a boy, saw it for the first time. It was just then that the taste for it was beginning to spread; people were talking of the novelty of the furniture made by Jacob after the antique, Quinquet was devising the lamps known by his name, and once so familiar in our own country, in which he endeavors to associate classic forms with modern uses. The new style invaded and took possession not only of the whole domain of art proper, but of everything to which its principles could be applied; to architecture, to the furniture of the houses and their decoration, and to the dress of men and women. The women found it comparatively easy to bring about an adaptation of the classic costume - superficial indeed, but attractive in its general effect; with the men, however, this was not so easy. The only adaptations possible in their case, were the cloak, which came into fashion as a substitute for the toga, or the peplum, - the women using the shawl for the same purpose - and the dressing of the hair, which was cut and trimmed after the antique busts of this, that, or the other Greek or Roman hero, one of the favorite styles being that of the bust known as the "Brutus" - brought down upon the forehead and cut square, or "banged," as our modern slang has it. Delecluze tell us that the hair-dressers were often seen meditating before their wig-blocks, endeavoring to reproduce the arrangement of the hair of the sisters of the Horatii, or of the wife and daughters of Brutus, in the pictures of David. It is true this new style was only a return to what had long been the established order of things in France. The pupils of David supplied to Quinquet for his lamps, and to Jacob for his furniture, the forms and ornaments that were called "Etruscan," because they were borrowed from the vases and other objects discovered only a few years before by Sir William Hamilton in the cemeteries of Tuscany, the ancient Etruria. But these forms and ornaments, identical with those in use by the Greeks and Romans, had long been familiar to the French as to all the people of western Europe; the whole art of the Renaissance was built upon these motives and the so-called Rococo or Baroque style, that sprang up in the later years of Louis XIV. 's reign, and that dominated the taste of Louis XV. 's time, was warred against with vigorous protests by the zealous advocates of the "classic." The very Colonnade of the Louvre, in whose shadow David had his studio, was built in the classic style in direct opposition to the advice of Bernini, who had been invited to France by the King, Louis XIV., for the express purpose of making a design for it. But in spite of all protests, the classic forms had lost ground more and more, until in the time of Louis XV., as we have said, they were completely swept away in the growing love for luxurious ease and freedom. The classic art had become a dead art; it was associated in the minds of the people who made up the bourgeois and the fashionable world, with formalism and restraint, and ideas that had had their day. If this art were to resume its sway, it could only be by having new life infused into it, and by bringing it home to people by another road than that so long traveled by pedantry and pretension. This was done in an unexpected way by the discoveries of Pompeii and Herculaneum and by the splendid finds of Sir William Hamilton and others, discoveries that inflamed the public imagination, and excited such a deep and wide-spread popular enthusiasm, not only in France, but in England, Germany, and Italy, that a complete revolution in taste was spontaneously brought about. "If to these details we add," says Delecluze, "the immense number of scientific treatises accompanied by engraved plates, published by writers upon the antique monuments of every description; buildings, statues, vases, coins, medals, in France, Germany, and Italy, it will be easy to understand how even the artist the least disposed to literary research himself, would almost breathe a taste for the antique art in the atmosphere in which he lived." It was after his return from Italy, that David began the sketch for his picture of "The Oath of the Horattii," of which we give a cut that may serve us in describing it. In the first picture which he had submitted to the judgment of his contemporaries - the "Saint Roch appealing to the Virgin to save the people of Marseilles from the plague" - painted in 1779, David, leaving behind him the art of Boucher, seemed frankly to accept the Academic principles with which he had been indoctrinated by Vien, and neither in the subject nor in the treatment is this picture to be preferred to any one of the similar conventionalities of the day; faded shadows of the faded Italians of the Decadence. But "The Oath of the Horatii" resembles no contemporary work. Even supposing that it was the fruit of his study of the antique sculpture while in Rome, it must be admitted that it bears no resemblance to any particular work, nor has it any real affinity with antique art in its spirit; we must be content to see in it an original product, the result of certain impressions made upon a mind of strong individuality, impressions which long lay dormant, and when they were called to the light were seen to have taken on an expression due to the mind of David himself. It is true that to our more modern eyes, accustomed to greater freedom in the arts, and long since completely out of touch with the restraints of classic art as it is generally understood, all the classic subjects of David have a certain stiffness and formality which repel us. There is something, too, in the poverty, for such it seems to us, of the surroundings, the absence at once of details and of suggestion, that removes them still further from our sympathy; we like a crowded scene, a multitude of incidents; that the eye may fly hither and thither over the stage and return when it will, to rest upon the chief actors in the drama. But David's pictures are like painted bas-reliefs where there is no background, and where the incidents are reduced to the fewest possible, and the action is understood once for all, at a glance. The subject of "The Oath of the Horatii," Le Serment des Horaces, is a supposed incident in the story for which we are indebted to Livy. Corneille founded upon this story his play, "Horace," to which in our day, the genius of Rachel gave a new life. The story is so familiar as hardly to need repetition. To avert the horrors of a war between the Romans and the Albans, for supremacy, three noble youths on each side agreed to stake their lives upon the issue of a personal combat. The three Roman youths representing the Horatian family agreed to fight the three Albans belonging to the Curiatian family. It happened that the sister of the Horatii was beloved by one of the Curiatii, and David in his picture imagines her sitting weeping with her mother and another sister, while her brothers take the oath to their father, who holds their swords and bids them swear never to return from the field unless they come as conquerors. The fight took place. Two of the Horatii were killed; the three Curiatii were sorely disabled, and the remaining brother of the Horatii pretending to flee, killed his wounded pursuers one by one, and returned alive and safe to Rome. But, as he entered the city his sister came with the rest to meet him, and while their faces were radiant with joy, hers was bathed in tears for the lover she had lost. Enraged at the sight of her tears her brother thrust his sword into her bosom exclaiming, "Go, and meet the enemy of your country in the land of the dead!" So much for the story as it is told by the pen of the historian, and shown in the scene of the dramatist. How has David performed his part? Is it not plain, from our engraving alone, that his picture belongs to the class which needs a comment to be understood? And will not those who have seen the picture itself admit that, so far as the purpose of its author is concerned, his work is independent of the things that to many persons would seem to be of the essentials of a picture - of beauty of color, beauty of line, of composition - of charm; in short, the soul, the essence of the painter's art?